So I’ve got this problem with Bubba Cat. Last night he pissed on my jeans. Again. Let me back up to the beginning. A year ago, Bubba started spending all of his time in my bedroom. A couple of trips to the vet and I was told he has arthritis. So I set him up with a special litter box that was easy to use, fed him separate from the others, and gave him alone time in the room. Then we moved to our current location. At first, he was fine. He interacted with all the others. He used the community litter boxes. But about the time I found out DeDe had cancer, he started up again. He acts afraid of the younger males, but they don’t seem to bother him until he starts growling at them. I now have TWO litter boxes in my room for just him. None of the other cats use them. And they are cleaned daily. I feed him separately. I give him water, and he drinks like he’s dying of thirst. For a bit. Then he knocks all his water out of the bowl. And, occasionally, he pisses on my clothes. As for his arthritis, he seems to get around OK. He loves to play laser. He seems to have no problems jumping up on the furniture. But I know he’s a cat, and he’s not going to let it be known that he’s hurting. So I guess it’s back to the vet with him, to see if there’s something else that can be done. Keeping my fingers crossed that it isn’t anything serious. I had a cat that did stuff like that, too. He was diagnosed with diabetes, and we had to give him insulin. I hope this is something easier, like a bladder infection. Good luck at the vet’s. Our mom had a diabetic kitty, and it sounds like what he did. Has he lost weight too? But you are right, it’s time to go to the vet. Hope the vet finds out soon. I would see if there is a kidney issue as that is so common in cats. Mom had a cat that started peeing around, even in bed one night and it turned out to be failing kidneys. Hope that is not the case but it could be, especially if he is drinking a lot of water. All that drinking of water is a concern. Sounds like one of our ancient male cats in the past. Good idea to get him checked out. Hopefully he’s just unsettled by changing group dynamics. So hard when they expect humans to read their minds when they haven’t completed training us yet. Sending love and purrs to bubba. Don’t worry you’re not the only one going back to the vet, I went two weeks ago with buggy because he wasn’t eating. He’s fine now, his sister trixie hurt her leg Saturday night so we are heading to the vet…*hugs* please let us know how it goes and let me know if I can help in any way. I can’t tell. Like I said, he spills the water. I hope it’s nothing serious and that things will go back to normal soon. Bubba I cross my paws for good news and I hope the vet will find out what’s wrong and there is way to help you. If Bubba is an older gent it’s probably worth checking for diabetes. Hope you find out what’s bothering him. I can relate. My cat Jake is old (16) and diabetic (which isn’t the end of the world! He’s had it for 7 years managed well.) He is meticulous about litter boxes. I clean them twice a day (I have 4 cats) and I have a lot of them. However, he doesn’t like when the others use them. He started peeing in one room on the carpet. Same spot all the time. I put an extra box in the room. He would sometimes pee in the box and sometimes pee on the carpet. I cleaned it well, put down plastic going up the wall and put a towel on it. Now when he doesn’t want to go in his special litter box (which is 2 ft. away from this spot) he pees on the towel. Much easier to toss them in the washer than clean carpet. Yes, there were trips to the vet. He runs a low grade bladder infection periodically but I think that’s the diabetes. Even after he’s been on antibiotics he still pees on the carpet. I wrote about it here http://coffeekatblog.com/2013/07/25/the-urine-caper-for-animal-lovers/ Good luck! I always say cats speak in “pee”. I hope you have an understanding vet who will “think outside the box”, and you have many experts to consult out here on the internet. Perhaps it’s just been too much change for him. So sorry to read this. I’m so happy you are taking him to the vet to rule out medical issues,. Then, if it’s behavioral, you can work on that. We’re keeping fingers and paws crossed and I;’m sending purrs. I am so sorry your having issues with your kitty! It seems so never ending. I’m anxious to hear what the vet has to say. Paws crossed for you all. Oh dear…poor Bubba…I’m sorry to hear this but hoping it’s something that will be easily taken care of…..I too thought of diabetes or kidneys when I read your story but the vet should be able to figure it out quickly with blood work and urinalysis…….SENDING HUGS TO BUBBA BOY and to YOU !! Since he sounds like an older cat, he may be having some cognitive difficulties. And, he’s been through a lot lately. Some folks just don’t cope with stress and change as easily as others. I hope it is nothing bad or difficult for the poor boy. I’ll just send up some prayers for Bubba and you and the rest of the gang. it’s been a hard time lately for you and I am so sorry. Hugs to all of you!!! I’m so worried of Bubba….I hope his problem is not serious…..he must have been suffering from what had been happening to DeDe…because they were best friends….. Mom clicked Like, but I don’t like this at all. “Back to the vet” is not my favorite word. Good luck, Bubba. Perhaps he doesn’t like the type of litter either. Cats are very particular about that. I have multiple litter boxes and use several different types of litter. And I have one older cat who won’t use a box at all but she uses those doggie training pads. I hope you can find a resolution! In addition to the type of litter consider the size of the box. I have another cat who has difficulty getting into the deeper boxes. So I have two shallow litter boxes set up for his use. We have used the same litter for 16 years for that reason. I hope it’s easily fixed! Magic thoughts for healing! Keeping Bubba in good thoughts. I hope will be okay. Keeping you in my thoughts. If it makes you feel any better, our cat loves to pee on damp towels. Left it on the floor after a shower? She’ll be right there to pee on it. She’s done this for the eight years we’ve owned her. To combat it we’ve just gotten tall covered laundry baskets and are uncommonly persnikity about picking up towels. Hopefully Bubba is perfectly fine and just being a grump. We’re wishing you all well. I hOpe I’m not repeating what others have said, lots of comments to peruse. But we had a cat that was doing exactly what yours is. It got to the point where she would look at one of us, actually catch our eye and then pee on something. Drinking tons of water etc. The vet said the peeing was trying to get our attention, her way of telling us something was wrong. She was diagnosed with diabetes, and we started giving her insulin shots twice a day. She lasted for several years on that treatment. Good luck. I wonder if Bubba is upset and/or depressed about so many changes, in addition to DeDe going to the Bridge? Whatever it is, you are all in our thoughts and prayers, dear ones. I hope the vet finds out the problem for him. Hope the vet finds what’s up. I just searched the net… trust me, you don’t want to hear. Sending good thought to Bubba. Having something pee’d on will get your attention, and it worked. The vet armed with your information is the best one to diagnose Bubba’s troubles – I hope they are minor. In addition to diabetes, you should ask the vet to check for cushings. It affects dogs and may also affect cats. Prayers for Bubba and hoping for the best possible outcome. Sorry to hear about Bubba. From my experience with my cats, drinking abnormal amounts of water is a sign of diabetes or kidney problems. 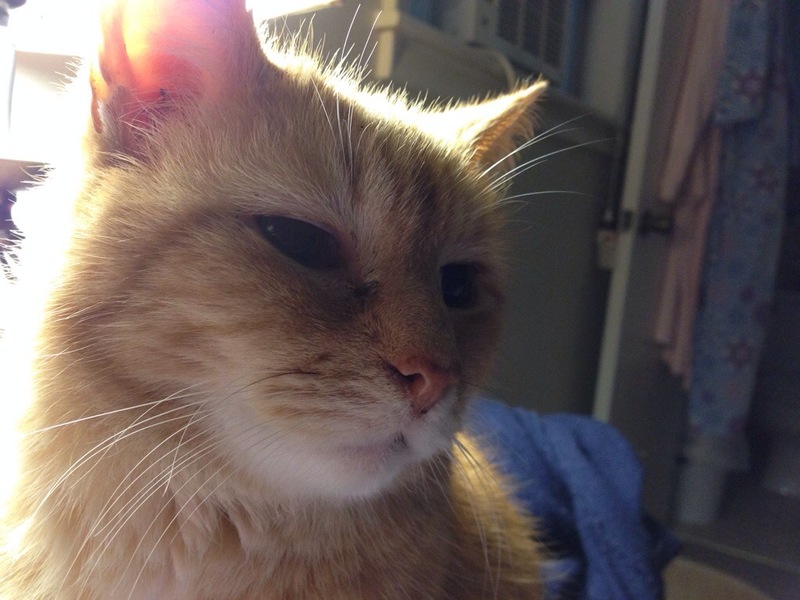 My cat, Max, had diabetes for which I gave him two insulin shots a day. After six years of this, he developed a kidney problem. I gave him fluids for six months before he succumbed to his illnesses. He was over 17 when he died. A trip to vet is the right decision. Keep us updated. And, of course I’ll pray for him. I even toss some in to Chewy’s food every now and again. 2) Feliway spray or plug-in diffusers? They are a pheromone product that has really helped A LOT of cats. I’ve even seen it used in vet hospitals between patients so as to minimize stress in feline patients. Might be worth a try. 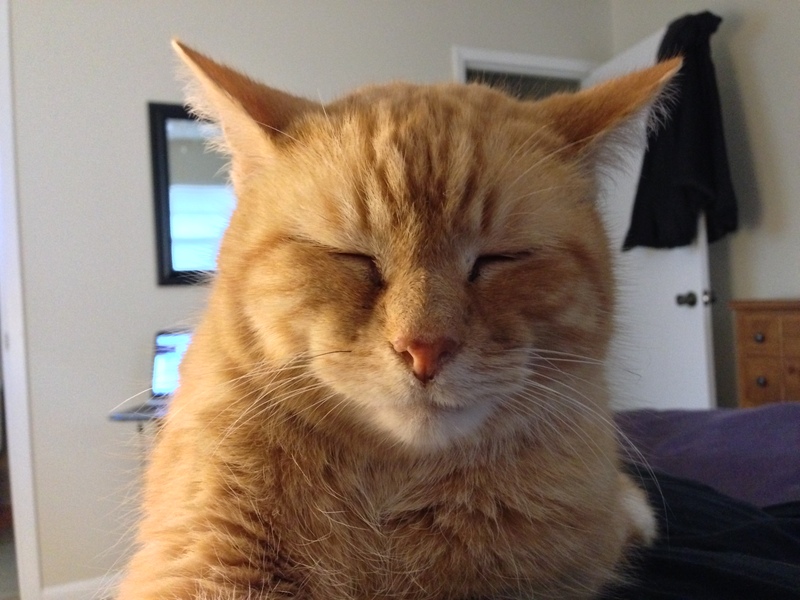 Feel free to email me if you want to talk cat ailments… and good luck! I didn’t read the other comments but the first thing that came to mind was that he had attachment problems. DeDe had cancer and that had some kind of impact on him. Seems that he might not be coping well with the diagnosis and animals can tell when there is something wrong. I hope that things are better as of now as I am late to reading this blog.